...explained Peter Gerdol, FIS Chief Race Director. With regards to the weather, it looks like clear skies ahead: „We expect similar weather to today, with sunshine and some light clouds”, commented Michael Huber, President of the Kitzbühel Ski Club. During today’s training, the Steilhang seemed to pose a particular challenge for the young athletes. 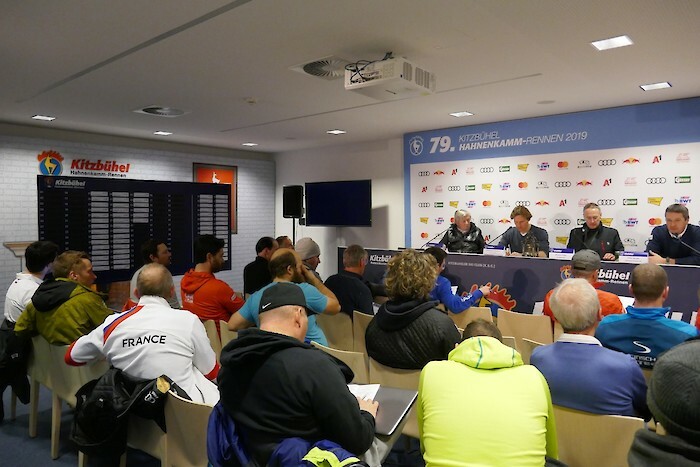 “That’s why it’s good that we’ll get another training session in tomorrow“, said Herbert Kammer, FIS Technical Delegate. After tomorrow’s training, the next highlight will take place in the Park of Legends: the Race Week opening ceremony will start at 18:15 with all participating nations. There will also be a bib draw for the top 15 Europacup athletes during the opening ceremony. At 10:30 hrs on Monday, the long awaited Downhill is scheduled to start.